Your bathroom sink is one of the most important fixtures in any bathroom because it has to be durable enough to handle your family’s daily bathroom routines while also seamlessly blending into your home’s style and aesthetic. At Henry Kitchen & Bath, our extensive catalog includes thousands of bathroom sink options in different finishes, styles, and features. For a Zen, spa-like bathroom, a vessel sink provides elegant lines and a luxurious feel that will transform your space from just a bathroom into a sanctuary. 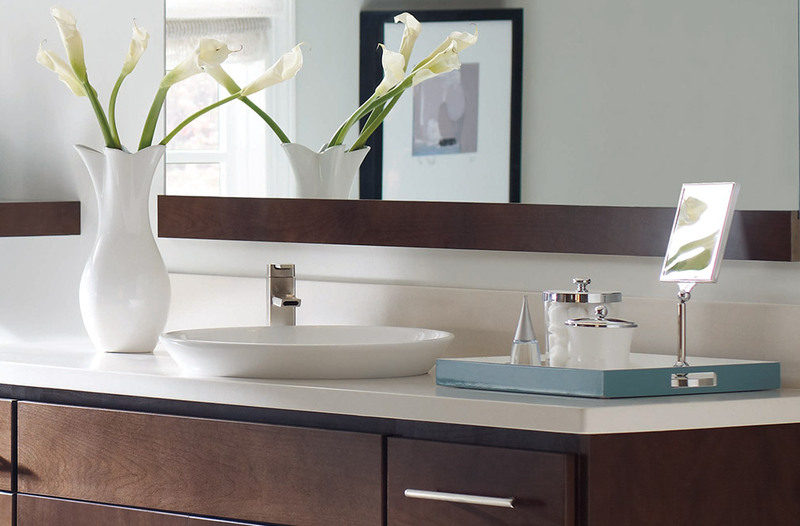 For small powder rooms, a pedestal sink offers complete functionality in a tiny square footage. For large families with busy bathrooms, drop-in sinks offer maximum strength and functionality, so you can get in and out of the bathroom quickly. Whether you are planning a quick bathroom refresh or a full-scale renovation, the designers at Henry Kitchen & Bath will work with your space and vision to find the perfect bathroom sink for your family’s aesthetic and needs. 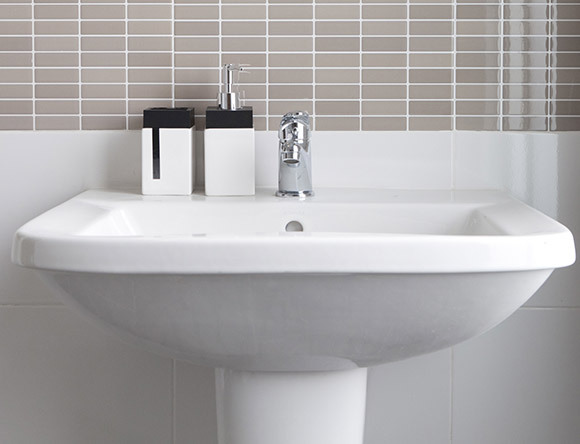 When choosing your bathroom sink, you should first consider the size of your bathroom. In a smaller powder or half bath, a pedestal sink could be the perfect balance between providing enough space to comfortably wash your hands while maintaining as much open floor space as possible. In shared bathrooms, however, drop-in or vanity sinks are better suited to serve all the people rushing to get ready every morning. After choosing the best sized sink for your family’s needs, you should decide what style of sink best matches your bathroom’s aesthetic. For large master bathrooms that serve as an escape from the hustle and bustle of everyday life, a vessel sink gives the luxurious, spa-like feel that will make you excited to come home and unwind after a long day. For families will small children or elderly adults, a drop-in sink is the most practical, functional, and comfortable choice. 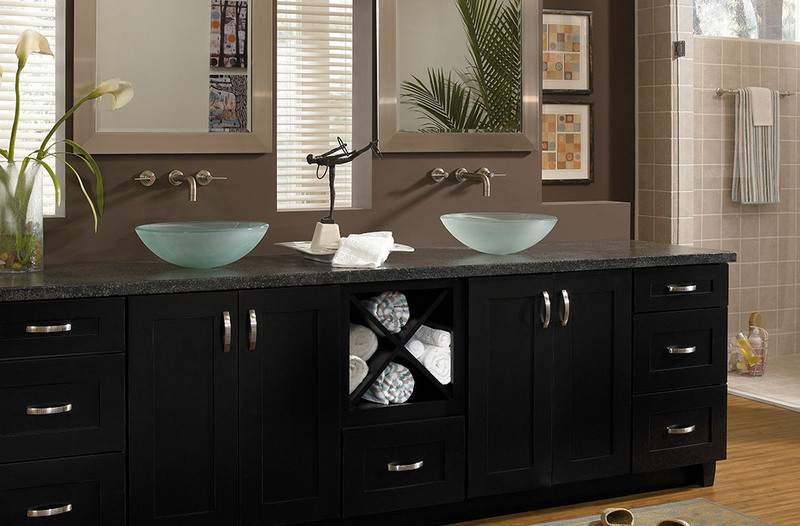 In large family bathrooms, vanity sinks are the most practical option because they also provide extra storage space for towels and products. Finally, you should pick a sink in a material that best complements the look of your new bathroom. Bathroom sinks come in many different colors, finishes, and styles, so no matter what your personal style is, you can find the perfect bathroom sink for you and your family at Henry Kitchen & Bath. With thousands of options from top brands, our designers will help you find the right sink for you and your family. As one of the most important and utilized fixtures in your bathroom, your bathroom sink should be functional, durable, and match your space’s style. With thousands of sinks from industry leaders like Jaclo and Toto, Henry Kitchen & Bath has the perfect bathroom sink to serve your family for years to come. 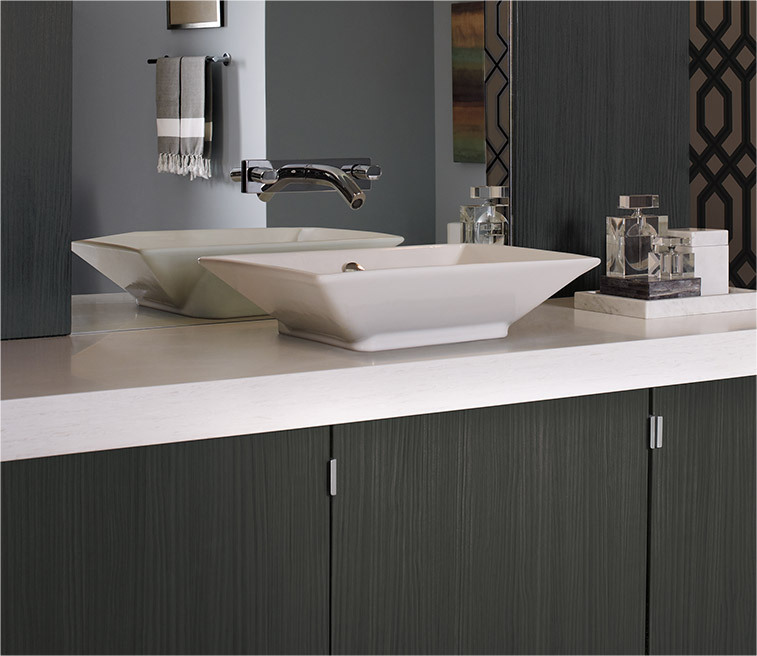 Pedestal sinks are a simple and elegant solution for small bathrooms. The tall, slender base provides unsurpassed functionality by maximizing both your bathroom’s floor space and counterspace. These sinks are perfect for powder rooms, guest baths, and smaller bathrooms where space is a premium, and storage is not a priority. Because drop-in sinks are installed by placing the sink down into the countertop, there is an edge or lip that rests on top of the counter extends all the way around for added support and stability. Drop-in sinks are one of the most popular bathroom sinks because they have the easiest installation process of all sinks and are therefore typically the cheapest option. 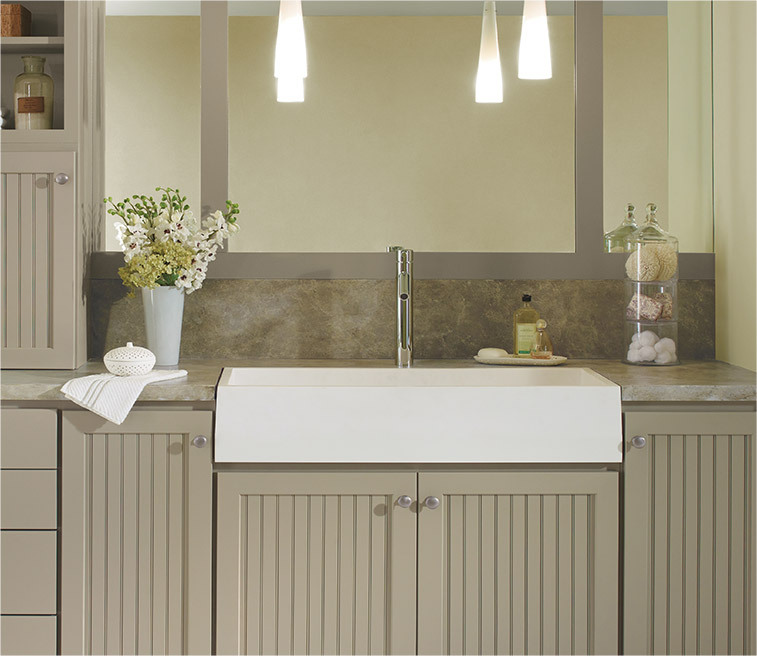 If you are looking to get the most bang from your buck, Henry Kitchen & Bath offers a wide selection of drop-in sinks, so you are sure to find one in a color and finish that best complements your bathroom’s aesthetic. 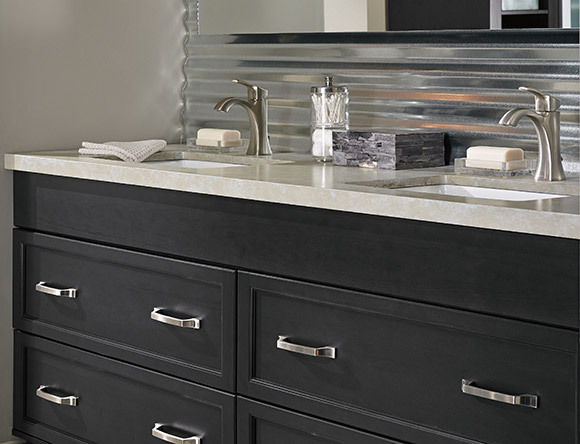 A vanity-mounted bathroom sink offers the most functionality for any bathroom with not only the option for multiple sinks but also built-in drawers and cabinets for maximum storage. For a large master bathroom, double-sink vanities provide plenty of countertop and cabinet storage space for all your products and towels. 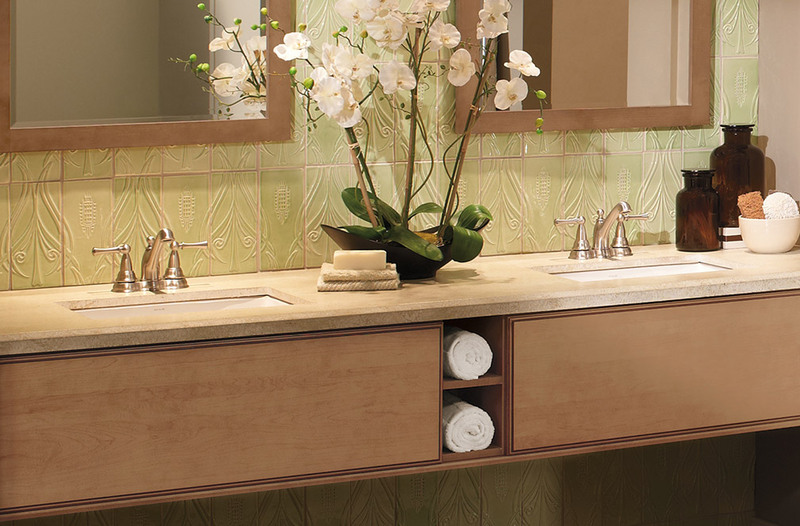 For apartment bathrooms or powder rooms, narrow vanities fit snugly into the smaller space while still providing ample storage and counter space. 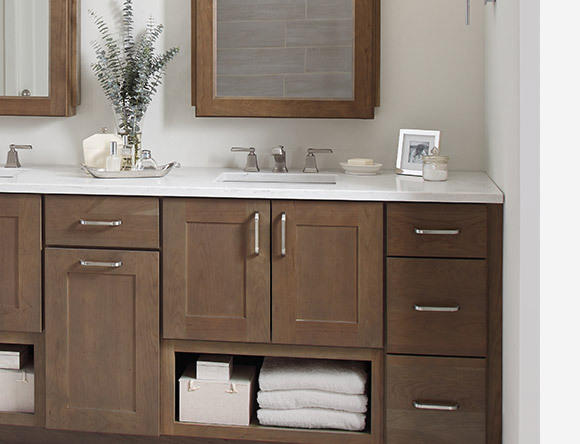 Whether you have a vintage, rustic, or modern style home, Henry Kitchen & Bath has thousands of bathroom vanities in different finish and material options to match any aesthetic. No matter what bathroom you are designing for, a vanity-mounted sink is the perfect combination of functionality and style. After you have chosen your bathroom sink, hiring an experienced installer is critical to ensure your new sink is fully functional for years to come. The expert designers at Henry Kitchen & Bath will work with you and our team of skilled installers to ensure that your new sink not only works perfectly but also seamlessly blends into your bathroom’s design. With thousands of bathroom sink options, choosing the right one can be an overwhelming task, but our designers will work with you and your vision to find the bathroom sink of your dreams. Choose Henry Kitchen & Bath for your next bathroom renovation or remodeling project – We can make your dream bathroom real!